They may not get as much hype as the Oscars, but the Golden Globes have actually been a Hollywood award ceremony staple for decades. Since 1944, in fact — making 2019 its 76th show. Back in the '50s, the likes of Marilyn Monroe, Elizabeth Taylor, and Grace Kelly made appearances in their most glamorous attire to receive honors for their work on screen. Today, Hollywood's elite continue to flock to the annual red carpet, often hand-in-hand with their equally famous other half. Will these charming duos last? We certainly hope so. But for now, let's flash back 20 to 30 years to see who was acting royalty in the '90s. 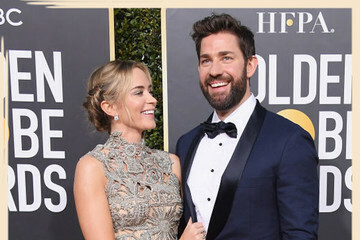 For your perusal, we gathered the A-listers who flaunted their love at Golden Globes of the past. Some have impressively stood the test of time and the hardships of fame, plenty have since gone their separate ways with quiet splits or publicized divorces, and many you'll forget were ever an item (oh, how quickly tabloids move on). Whatever the case, let us deliver some nostalgia with this walk down memory lane.